This year I've been getting into travelling a lot more. I'll be honest, I hadn't left the UK in over 10 years until this year so the whole makeup and skincare packing thing was completely new to me. Now that I've become more comfortable with the travel restrictions and packing light, I thought I'd share my Top 10 beauty travel packing tips for any of you going on holiday soon. Whether it's a city break or sunshine getaway.. this is for you. 1. Pack the essentials first. I like to pack the products I can't go without first so foundation, eyebrow products and mascara always get top priority in my makeup stash for travelling. As long as those fit, I'm all set. 2. Leave the skincare routine at home. Let's be honest, your skin really won't suffer all that much with a week's break from your skincare routine. Save some space in your luggage and pick up some face wipes. Plus, you'll have much more room for liquids as face wipes don't count as a liquid! 3. Use samples and minis. We all have little pots of moisturiser or cleansers lying around so why not take advantage of using them up? Boots also sell mini versions of Benefit mascaras for around £10 so save some room in your makeup bag and go mini! 4. Don't pack what you'll buy. If you know you'll be hitting Sephora for a specific product, why bring along a similar one? 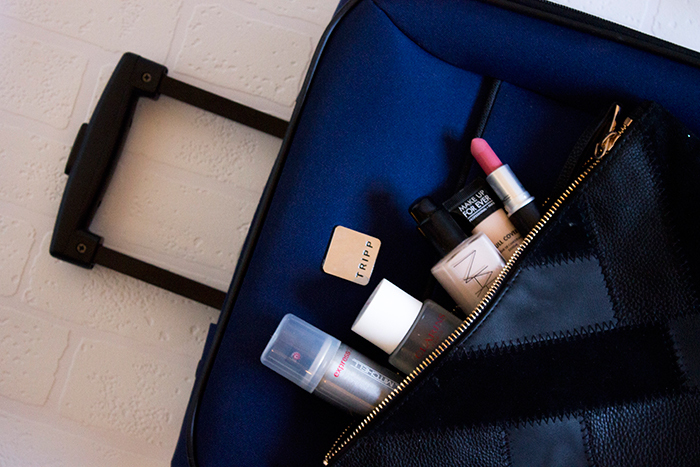 It means when you're coming home you'll have much more room in your bag for new products. 5. Narrow your colour choices. Do you really need 5 shades of red lipstick? Lets be honest, you probably won't even use one of them let alone 5. Narrow it down to 1-2 shades: your everyday shade and your going out shade. 6. Check your liquid allowance. You're only allowed liquids up to 100ml which fit in the little liquids clear bag so make sure none of your products exceed that amount. If they do, decant them into travel pots and save some space. Did you know lipsticks count as liquids? Basically, if it can be melted down into a liquid.. it's a liquid! Keep your powder products separate, these don't have to go into the liquid bags! 7. Buy a perfume dispenser. Who wants to carry around a big heavy perfume? Pick up a travalo.. or two if you want some perfume choices! Alternatively, lots of brands do rollerball versions now. 8. Ask friends to bring products. You don't all need to bring a separate tube of toothpaste, you can easily share it between you. Ask one person to bring the toothpaste, another for hair products and another for makeup removal.. sorted! 9. Find out what products are restricted. You can't always bring everything you want with you. Some airlines might not let you take disposable razors in your hand luggage so it might be worth looking into alternatives, such as a wax, hair removal creams or even an epilator. 10. Remember the SPF. Even if you're travelling to a cold country, make sure you pack your SPF. Your skin isn't used to the temperature change so make sure it's protected. The sun isn't so fun after you get burnt on day 1! Those are my top 10 tips for packing your beloved beauty products! I'd love to know if anyone has anymore tips, feel free to leave a comment below.